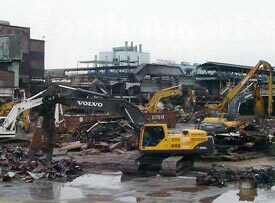 North American Dismantling Corporation (NADC), a nationwide company located in Lapeer Michigan, specializes in heavy industrial demolition, strip outs, and many other aspects of specialty demolition. NADC also has extensive experience in environmental assessment and remediation, project engineering and specialty construction. 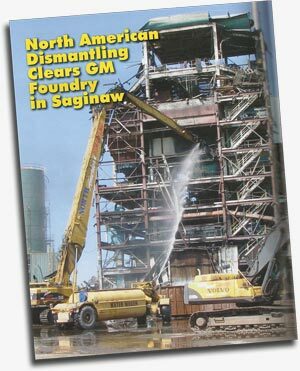 Recently, NADC, as the prime contractor, has completed the demolition of an old GM Malleable Iron Foundry, once a thriving industrial facility, located in Saginaw, Michigan. The massive one-million sq. ft. General Motors facility is centered on a 275-acre site and opened its doors for production of metal sand-mold castings in 1917. The foundry continued to supply the automotive market for ninety years until the foundry permanently closed its doors in June of 2007. The complex boasts a nine-story building as well as a single story plant with towering 30-ft. ceilings. There are many tunnels, pits and basements, all of which North American Dismantling must contend with. The foundry also includes additional outbuildings such as a maintenance facility, a recycled water treatment facility, employee locker rooms, and numerous storage buildings and utility sheds including an oil shed, light non-aqueous phase liquids pump and treatment shed, a malleable substation, and butler's quarters. North American Dismantling began remediation work on the foundry in November of 2009. Commissioned by Motors Liquidation Company of Detroit (formerly General Motors), the $15 million dollar project was recently completed. NADC's scope of work called for the total demolition and removal of all structures down to the concrete foundations. "One of the first steps in the demolition process involves asbestos remediation, environmental cleaning and testing - using various testing procedures to ensure we are meeting or exceeding the criteria set forth in the U.S. EPA's plan" say Dan Clark, both a project manager and estimator for North American Dismantling. 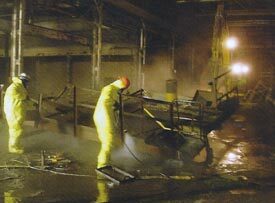 "We have contracted with EQ Industrial Services (EQIS) of Ypsilanti, Michigan to blast and powerwash the interior before we demolish the building." In 2007 General Motors completed a Facility Environmental Plan (FEA) indicating a large amount of PCB-contaminated material existed throughout the facility that included sludge, dust, and contaminated water. Possibly one of the most challenging aspects of this contamination was the accumulation of PCB's between layers of lead paint on the building structure itself. The facility also used asbestos-clad systems which added yet another pollutant to be dealt with. Subcontractor National Environmental Group of Flint, Michigan was responsible for both lead and asbestos abatement. 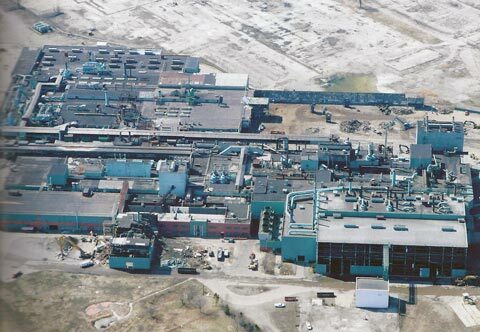 In addition to the widespread PCB, lead, and asbestos contamination, there was universal wastes, heavy metals, and other ACMs, all of which needed to be addressed by North American Dismantling. The remediation process included the sealing off the storm sewers, capturing any water used in powerwashing and cleaning of the contaminants, and vacuuming hazardous and non-hazardous dust and debris, all of which must be disposed of properly. With all of this in the hands of North American Dismantling, Dan Clark says, "we wrote a comprehensive self-implementing testing plan that was approved by the EPA before we even started. " Clark stated, "We're quite proud of our environmental plan for the Saginaw site. Extensive pre and post cleaning samples were collected to delineate the extent of any contamination. Everything was delineated, dismantled and hauled offsite for recycling or proper disposal at the appropriate landfills. As a result an estimate of over 90% of the steel and other building material for the site were tested and recycled. 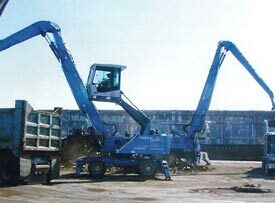 With the remediation and environmental cleaning finalized, NADC completed the demolition of an estimated 20,000 tons of ferrous and non-ferrous materials, which was processed and prepared for recycling by North American Dismantling fleet of Caterpillar and Volvo hydraulic excavators, as well as many other types of specialty demolition equipment. "We were awarded this contract because of our experience, manpower, and strong health and safety records" states Clark. "Because of the extensive cleanup required, this will be one of our more challenging projects but I'm confident we'll do a great job." GM's Saginaw Malleable Iron Foundry, once a thriving manufacturing facility that became contaminated by an array of toxic pollutants, is now in the process of being cleared in an environmentally sound manner with the site being reclaimed by mature, pollutant free, contaminant free, and facility free, all with the expertise of North American Dismantling Corporation.